Improve the size of your mind's working memory. Play Tic Tac Toe aka Noughts and Crosses. Get three in a row to win. Applications that are deployed using MS ClickOnce technology run in a "sandbox," with a limited set of permissions based on a security zone. 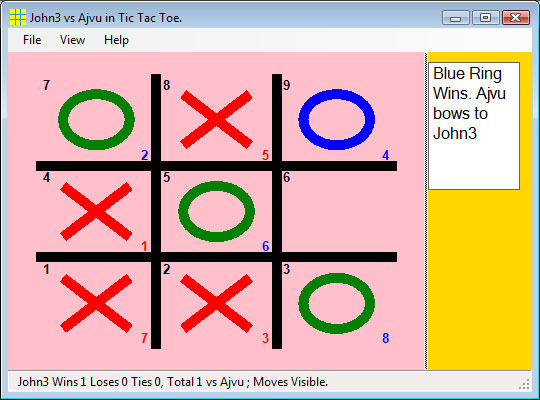 Local and Internet "Tic Tac Toe" Game, also known as "Noughts and Crosses" with "Chat". The checked names are currently playing and cannot be challenged or chatted to. You can chat only with your opponent while you are playing. You can chat only with everybody between games. This is my first attempt to write artificial intelligence software. In other words, software that can learn from experience and apply that knowledge to goal directed action, in this case to win or to avoid losing. See Details. Visualize and Play Tic Tac Toe in you head. Under the "View" menu uncheck "View Moves". In this mode the board is not displayed, only a large digit from 1 to 9 is displayed corresponding to the latest move. (Think of the keypad on your phone or keyboard) Therefore, you must remember your move and your opponent's moves in order to play effectively. Some people can play chess or checkers in their heads. This game will help you to move towards that ability. A bigger mental working memory has great utility for many mental tasks and is well worth developing. Some of the many benefits of a larger working memory in school work are finishing a math test (Arithmetic, Algebra, Calculus) by writing down less steps and doing more steps in your head. In real life, it will help you with things like making change, dividing up a restaurant bill with tip. Spotting correlations and trends in the financial markets. Bringing together more relevant facts when making a presentation or a decision. Please email me with more examples of how your mental powers have improved your life. Advice on spreading the word about this game would also be appreciated. Back to game features, in any mode you can click on the empty space where you want to move, or use your keyboard on the keypad (1-9) or normal numbers on the keyboard. In all modes the game software will still let you know if you win, lose or tie and keep track of your statistics for this session. Once the game is over, you have several options, you can start a new game by pressing the enter key or a right click of the mouse will also start a new game. Or you can chat with everyone currently online, or click on an unchecked player to challenge them. During the game you can only chat with your opponent and you will not be interrupted by other players or challengers. Available from the "View Menu". Of course you knew it, this mode provides no game display at all. It does however tell you when it is your turn and will still let you know if you win, lose or tie and keep track of your statistics for this session. Separate session statistics are kept for each View Mode. All session statistics are reset when you change opponents or disconnect.